Tomas is using Smore newsletters to spread the word online. 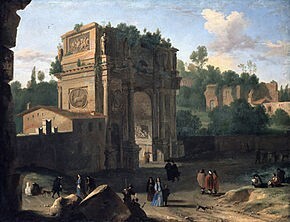 The Arch of Constantine is a triumphal arch in Rome, situated between the Colosseum that is an amphitheatre and the Palatine Hill that is the centermost of the seven hills in rome. It was erected by the Roman Senate to commemorate Constantine I's victory over Maxentius at the Battle of Milvian Bridge , it is the latest of the existing triumphal arches in Rome, and the only one to make extensive use of spolia (that is the recycling of materials for making ornaments and to decorate) , re-using several major reliefs from 2nd century imperial monuments, which give a striking and famous stylistic contrast to the sculpture newly created for the arch. The arch is 21 m high, 25.9 m wide and 7.4 m deep. It has three archways, the central one being 11.5 m high and 6.5 m wide, the lateral archways 7.4 m by 3.4 m each. The top (called attic) is brickwork reveted with marble. A staircase formed in the thickness of the arch is entered from a door at some height from the ground, in the end towards the Palatine Hill. The general design with a main part structured by detached columns and an attic with the main inscription above is modelled after the example of the Arch of Septimius Severus on the Roman Forum. 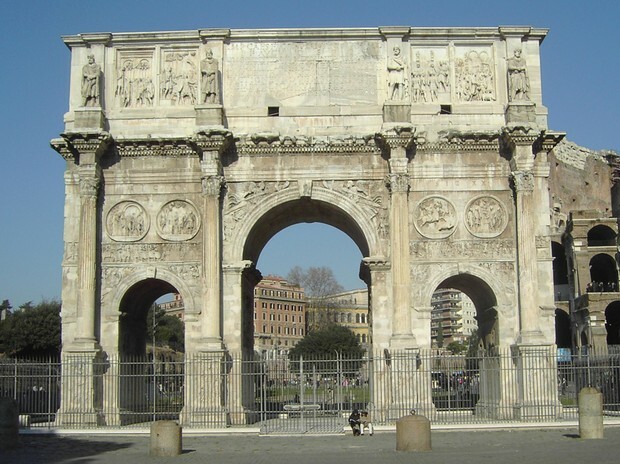 It has been suggested that the lower part of the arch is re-used from an older monument, probably from the times of the emperor Hadrian (Conforto et al., 2001; for a defence of the view that the whole arch was constructed in the 4th century, see Pensabene & Panella).